NASA is testing Alta Devices solar technology at the International Space Station in order to evaluate Alta’s technology for future NASA low-Earth orbit missions, including powering CubeSats. Alta Devices also recently announced a new efficiency record of 29.1% for its single junction solar cell, as certified by Fraunhofer ISE CalLab, marking the seventh consecutive time, dating back to 2010, that Alta Devices has achieved this record. This milestone represents the thirteenth cell or module solar efficiency world record achieved by Alta Devices. Following years of collaboration between NASA and Alta Devices engineers, NASA Marshall Space Flight Center (MSFC) selected Alta to participate in the MISSE-X (Materials International Space Station Experiment) flight investigation launched in November on board the NG CRS-10 mission. The goal of this test is to evaluate new solar cell and package technologies in support of future NASA missions requiring solar cells with high efficiency, high packing density, and very low mass. 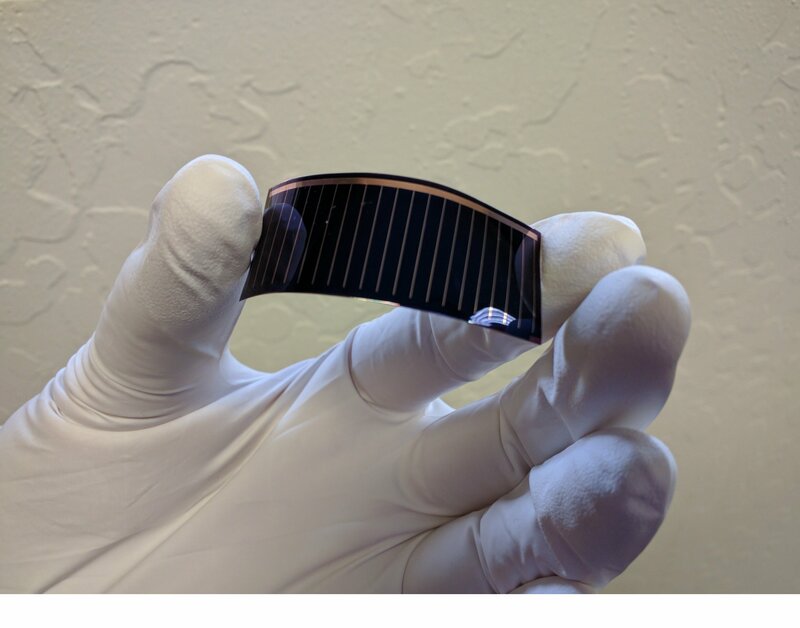 Alta Devices engineers worked with NASA MSFC scientists and vendors to develop an array of nine solar cells with innovative packaging materials. The cells were fabricated and delivered to NASA for testing during the first half of 2018. Integration into the MISSE sample carrier was carried out at the Alphaspace facility in Houston, Texas in August, and the experiment was transported to the International Space Station by the NG-10 Antares rocket on November 17th of this year. The solar cells will be installed into a zenith-facing position on the station in the coming weeks. After one year of exposure, the solar cells will be returned to NASA and Alta Devices for evaluation. NASA and Alta Devices have developed scientific models to simulate how the solar cells may be affected by their on-orbit exposure, and the final sample evaluation will allow the teams to refine their models, enhancing the accuracy of predictions related to solar cell and package performance in future, longer missions. In November 2018, Alta Devices provided its single junction gallium arsenide solar cells to Fraunhofer ISE CalLab, a German based solar energy testing laboratory and one of the world’s leading renewable energy research authorities. These cells were certified by Fraunhofer ISE CalLab as being 29.1% efficient. Gallium arsenide has several unique characteristics; high efficiency, excellent UV and radiation resistance, flexibility, and low weight. Alta chose to focus on gallium arsenide because of its intrinsic efficiency advantages, as well as its ability to generate electricity at high temperatures and in low light. With its latest record-setting conversion efficiency, Alta’s gallium arsenide solar technology is ideally suited to powering products that need autonomous power such as small satellites, unmanned aerial vehicles (UAVs), and autonomous vehicles. In addition to Alta’s technological advances, which push the limits of energy density, Alta has changed the manufacturing economics of solar to enable formats and form-factors that were previously not possible. Gallium arsenide (GaAs) is typically expensive to produce. However, Alta invented a manufacturing technique that develops extremely thin layers of GaAs (a fraction of the thickness of other GaAs solar cells). Alta’s cells are about one micron thick; for comparison, a human hair is approximately 40 microns thick. By utilizing a very thin layer of material with the highest energy density possible, the amount of material needed is low. Therefore potential system costs can be dramatically reduced. Alta Devices recently launched its Gen4 AnyLight™ solar technology, demonstrating continued success in improving its excellent power-to-weight ratio. This fourth-generation technology resulted in a 160 percent upgrade in power-to-weight ratio over its third-generation technology. Continuous advances in power-to-weight ratio are critical for tomorrow’s small satellites, autonomous UAVs (unmanned aerial vehicles), electric vehicles, and autonomous sensors. Alta Devices is empowering autonomy by delivering the world’s most efficient, thin and flexible mobile power technology. By converting light of any kind into electricity, Alta Devices AnyLight™ power technology extends the energy source of a system, and in many cases, completely cuts the traditional power cord. The solution can be completely integrated into the final system, and is ideal for use in unmanned systems, satellites, electric vehicles, consumer electronics, sensors, or anywhere size, weight, and mobility matter. Alta Devices holds world records for energy conversion efficiency and is headquartered in Sunnyvale, CA. For more information, visit http://www.altadevices.com. Alta Devices is a Hanergy company.